I love bargain tech finds for their low cost to high satisfaction ratio. When I picked up my Nexus 9 tablet, I was anxious to get it covered with a case. But my second concern was making it a productive powerhouse by adding a keyboard or keyboard case. The problem was most cases were not specific to the Nexus 9 or so expensive I could buy a second tablet for the price. So I started to seek out other options. Several name brand cases were on the market, but I wasn’t sure that they were worth their price tag either. Most were priced upwards of 80 dollars, which was too steep for an experimental purchase for me. This led me to look on Amazon for a bargain that was worth the gamble. I had some luck with an Anker external battery in the past. It worked well and was reliable to hold a charge when not in use. Why not give them a try? I ended up purchasing the Anker Ultracompact Bluetooth Keyboard for less than 20 bucks. I had two color options, black or white. I went with black because it matched my tablet and case. The keyboard runs on just a few AAA batteries and a Bluetooth connection. 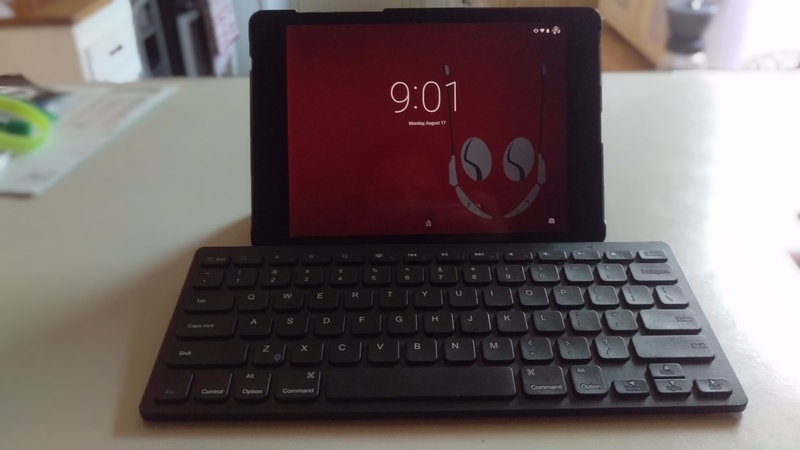 It was extremely easy to pair with my Nexus 9. It also pairs quite nicely with my HTC One M9. 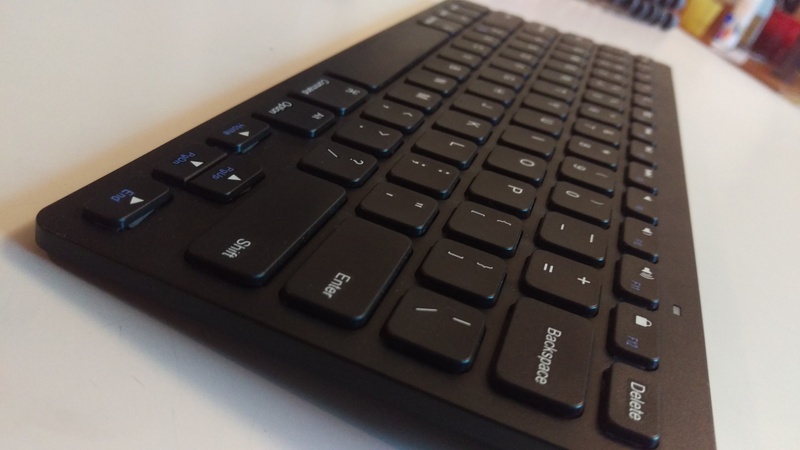 In fact, I’m writing this blog post using the Anker keyboard paired with my phone. I haven’t tried it just yet, but I imagine it will pair just fine with my television as well. The keyboard is comparable to a laptop’s keyboard in size and layout. It does not have a number pad, but it has plenty of functionality built in on the top row. Brightness, multimedia controls, and volume are all situated on the thin top row of the keyboard. Honestly you can’t go wrong with this keyboard. It pairs well and rests at a nice ergonomic angle for typing longer posts or documents. Another interesting bonus I discovered is that my keyboard will work in partnership with SwiftKey on my Android devices. That allows me to type from a physical keyboard with predictive completion and auto correction at the same time. It’s really quite nice and saves my backspace button from getting abused. If you’ve been hesitant to make a keyboard purchase, hesitate no more. You really can’t go wrong with the Anker Ultra Compact Bluetooth Keyboard. The value is through the roof for such a small price tag. Next Post Why Should I Start A Coffee Subscription? Have you had issues when using yours, with the onscreen keyboard coming up sporadically while your not using it? Like the OSK pops up and down randomly? I haven’t. It may have something to do with the onscreen keyboard you are using. I use SwiftKey and they play nicely together. I even tried unpairing. So far it’s when I have iOS Messages open. I am using the Apple Keyboard. Ok, I’m less familiar with iOS. It still may help if you install SwiftKey. It is available on iOS.